We were on a mission – the district technician, service forester, and I – and quickly got to work. Taking measurements and recording numbers, we were on a search to find and confirm the largest nominated sugar maple tree in Geauga County. This was Geauga County’s inaugural BIG TREE Contest, sponsored by the Geauga Soil and Water Conservation District (SWCD) with support from our Division of Forestry’s service forester. 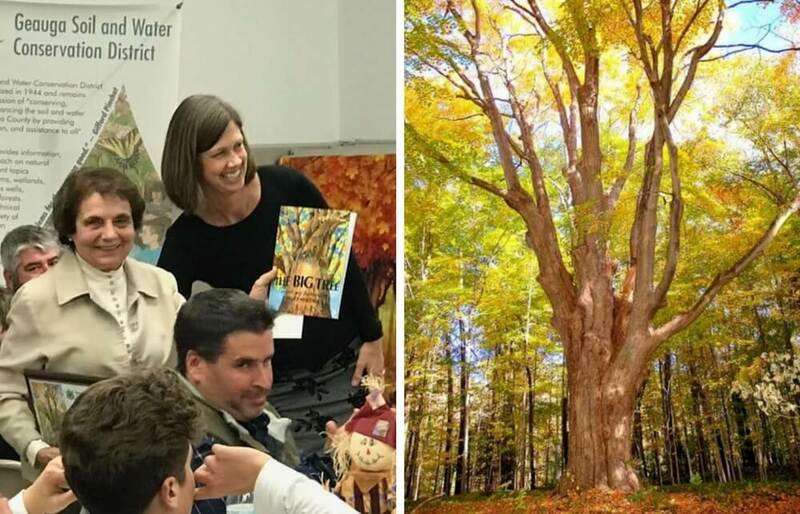 The sugar maple (Acer saccharum) was chosen as the contest’s featured tree species, honoring its ongoing significance to Geauga County’s maple syrup production industry. Throughout the day, we traversed colorful autumn landscapes where sap runs and maples rule, seeking the largest and perhaps oldest species in the county. Though we would “size up” several more trees throughout the day, it was here where we indeed found our champion tree. Impressive and immense, this tree stands at approximately 111 feet high, with an estimated crown spread of 87 feet, a 55 inch diameter, and circumference of 14 feet, six inches (174 total inches). In order to compare and rank our biggest trees, these numbers are then used in a formula to determine an overall tree index value. Standing next to a tree of this size can initially take your breath away. It is enormous. It is magical. It is incredible and rare. Most importantly, it is still standing!! Curiosity and awe quickly give way to a flood of questions in your mind. “How old are you? !” “What historical events have you witnessed?” “Who climbed on your limbs?” “How did you survive this long?” Oh, the stories it could tell! Joan Demirjian of Bainbridge Township, current owner of this tree, has had the privilege of hearing some of these stories from the previous owner who has passed them on, along with his deep love and respect for this extraordinary sugar maple. Our champion tree is estimated to be 250 – 300 years old and insights to its historical significance are easy to find nearby. Its life began before our country was formed, quite possibly before the Revolutionary War. In fact, it stands next to the Southwest Burying Ground, a cemetery in Bainbridge Township dating back to 1831 where a Revolutionary War soldier is buried, along with members of a famous pioneer family who settled there, along with railroad workers who died and were buried in a common grave. Like the weathered headstones, other nearby remnants in the landscape whisper tales from the past and serve as reminders of the longevity of this tree’s life. Once a bustling site of innovation and industry, now only foundation stones remain from the grist mill, saw mill, tannery, brickyard, cheese factory, and distillery that were in full swing at the time of this tree’s youth. The nearby river that once powered these bygone industries still flows, now as a designated State Scenic River. And this tree was tapped for maple syrup for over 50 years! Imagine all that this tree has seen through the hundreds of years of its existence. The people and settlements are now gone, yet this landmark tree still remains.